Robotic Automation reduces manual work during product development. By executing automated image quality testing, you can eliminate discrepancies between tests. 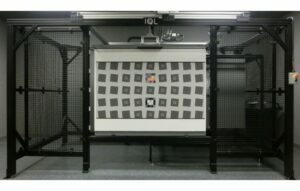 Dynamic camera alignment and tunable distance parameters increase repeatability of tests, decrease errors, and minimize in-house resources needed for testing. Program your lab to test multiple scenes with one device, and implement feedback control loops for automated lighting adjustments. 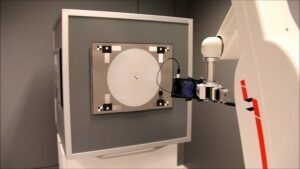 Move test devices into position for different charts or scenes with a 6-axis robot arm with 500mm (20″) reach in any direction and 360-degree waist rotation. The Sofica Chart Carousel is a cost-effective and reliable automatic test chart changer, which can be used in any imaging quality laboratory. The Automatic Test Chart System places test charts into the imaging plane automatically and precisely, offering quick interchangeability between many charts at the touch of a button. Custom size up to 8 panels available. 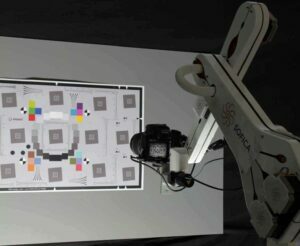 Carousel can be equipped with multiple LED lightboxes and transparent testing targets. Accommodates both small and large-sized test charts. The System uses sensors/detectors to automatically return charts to the correct stowed position when no longer in use.